Home :: Test Equipment :: AirView2-EXT 2.4GHz low cost Spectrum Analyzer from Ubiquiti with external antenna and connector. 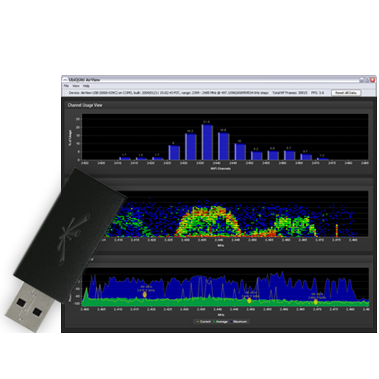 AirView2-EXT 2.4GHz low cost Spectrum Analyzer from Ubiquiti with external antenna and connector. The worldwide unlicensed 2.4GHz band is becoming increasingly crowded. Cordless phones, baby monitors, alarm systems, and a massive collection of wifi devices all battle with each other to share the same medium for communication. For many professional installers, analyzing the 2.4GHz spectrum to determine the optimum setup for new wireless equipment is imperative. Typically, this is done with a tool called a "Spectrum Analyzer", costing from several hundreds to tens of thousands of dollars, which is capable of displaying the distribution of RF energy in the 2.4GHz band. AirView9-EXT 900MHz low cost Spectrum Analyzer from Ubiquiti with external antenna and connector.